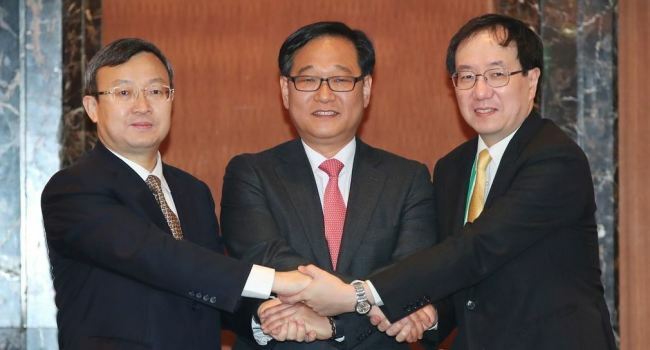 Representatives of South Korea, China and Japan are to discuss a regional free trade deal in Beijing from Thursday to accelerate negotiations on market liberalization for products, services and investment, the Seoul government said Wednesday. The two-day negotiations will be attended by senior trade officials representing the three nations, who will discuss ways to open up goods and services markets and lower other trade barriers, the Ministry of Trade, Industry and Energy said. This is the 14th round of negotiations. The three countries last held talks in March in Seoul. The talks come at a time when China is seeking to strike trade pacts with other nations amid rising pressure from the United States, but the trio has made little progress since the first round of negotiations in 2012. The three Northeast Asian nations are also working with other countries in the Asia-Pacific region to build a Regional Comprehensive Economic Partnership, a large-scale trade deal involving 16 nations. RCEP is, in essence, a massive regional trade deal between the 10 members of the Association of Southeast Asian Nations and the six countries with which ASEAN has free trade agreements -- Korea, China, Japan, India, Australia and New Zealand. RCEP negotiations are expected to be completed by the end of next year. Yoo Myung-hee, Korea’s deputy minister for trade negotiations, will call for a trilateral FTA that functions at a higher level than RCEP by lowering barriers in goods, service and investment sectors, the ministry said. The lack of progress on a trilateral pact between Korea, China and Japan stems from differences on the appropriate level of market liberalization as well as political issues. In terms of markets, “Korea and China, particularly China, have resisted opening their markets on manufacturing, automobiles and digital devices (in) which Japan has world-class competitiveness,” said Suh Jin-kyo, a senior researcher at the Korea Institute for International Economic Policy. “Korea and Japan, particularly Japan, have also resisted opening their agriculture markets to China, which has cost competitiveness,” Suh said. As to the political issues, Japan’s refusal to acknowledge and make proper reparations for its historical and wartime atrocities has created tension in its relationships with Korea and China, which has also affected their trade talks, he said. If the trade deal among the three nations is sealed, the trade volume will account for around 19 percent of the world’s total trade, making it the third-largest trade bloc surpassed only by the European Union and North America. A decade after the trade deal is signed, Korea’s gross domestic product can be expected to rise 1.45 percent, according to KIEP. Currently, China is Korea’s largest trade partner and Japan is its third-largest trade partner, with the US at No. 2.